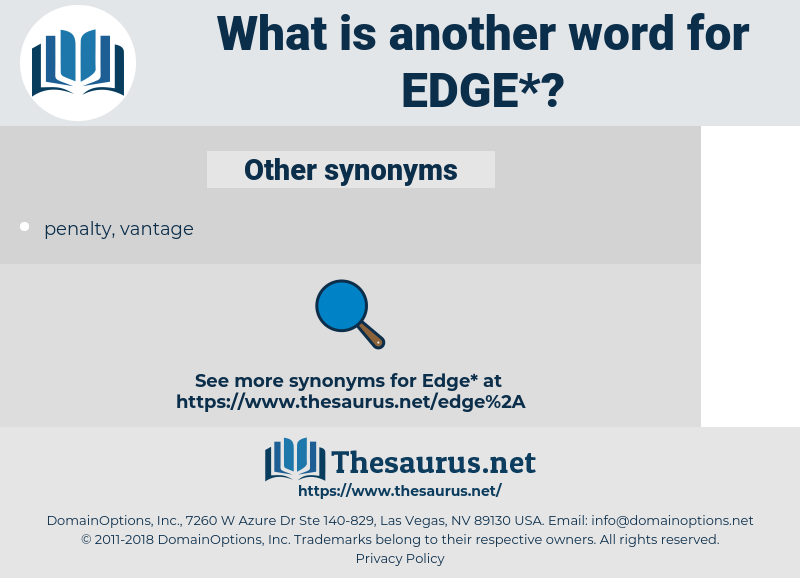 What is another word for edge? To sharpen; to border or fringe; to incite; to provoke; to move gradually. 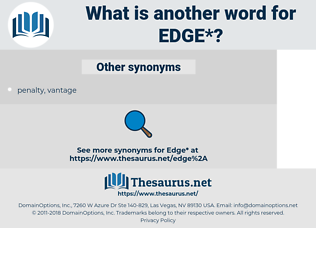 ledge, verge, margin, periphery, wedge. restrictions, cylinders, upsets, increases, Axes, Downs, border, borders. teeth, bangs, forefront, ridge, avant-garde, board, corner, Bordure, threshold, circumference, border, breakthrough, flange, onboard, shoreline, high-technology, slope, scoreboard, advance. bottom, center, interior, inside, disadvantage, block, middle, nadir, surface. disparity, inability, shortcoming, incompetence, hitch, heart, gentleness, hindrance, ineffectualness, impediment, inadequateness, ineffectuality, setback, mildness, imbalance, ineffectiveness, detriment, softness, check, core, inefficiency, kindliness, lurch, inner, impairment, rub, failing, disability, catch, inequality, penalty, embarrassment, unevenness, stranglehold, incompetency, inadequacy. blunt, thicken, unbind, dull, lose, release, permit, wallop, let go, allow, free. The Celebrity was standing with his back to Miss Thorn, at the edge of the water. Has a farm, and runs it well, about three miles back, but he's away pretty often in the North and at a settlement on the edge of the bush country. eats, etc., eadwig, EDS, ethic, edgeways, edgewise, edgy, ethos, edacious, educe, eidetic, eidos, eatage, ethics, etch, eye disease. featheredge, lip, luff, wayside, chamfer, razor edge, trailing edge, selvage, brim, hem, kerb, bevel, milling, bezel, border, selvedge, Berm, groin, cant, rim, roadside, deckle, leading edge, curbing, deckle edge, cutting edge, knife edge, curb, shoulder, molding, moulding. demarcation line, side, demarcation, limit. Favourable Position, superiority, favorable position. march on, pass on, advance, go on, progress, move on.